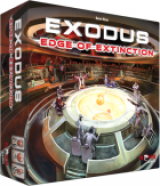 Exodus: Edge of Extinction is the first expansion for Exodus: Proxima Centauri(Revised Edition), featuring six asymmetrical factions, new technologies and new modes of play. Experience the next chapter of an immersive story in which the remnants of humanity go to war against each other over a system they believe to be Proxima Centauri, and become the emperor of all humanity. Lead one of six unique, fully developed and beautifully illustrated factions with their own histories, strengths, unique special abilities and a set of new, exclusive technologies.